Front door décor is an important part of your home decorating since it's the first impression of your home and the promise of what a visitor will find inside. g it where the door is. This exercise gives you a brief idea how the large amount of color will look on your home, but don't leave it to chance, take advantage of the free design tools websites offer. There are several ways you can decorate your front door. The first is with the hardware choices you make. Door bells: It's always about the details when it comes to design, so don't overlook the style of your doorbell ringer. This little button may be used frequently if you have an active social life, so consider the use and even abuse it might suffer when deciding on the ideal one for your front door area. Door knocker: This selection can be fun since there are so many creative styles, including whimsical ones. Door wreath: Many people dress up their doors with door wreaths far beyond a Christmas wreath. Some have a wreath for every holiday that they change out, using a seasonal one in between. You can use artificial, dried flowers and herbs, metal, wood, and a many other materials for your wreath. Just make sure what you select is weather resistant. The last thing you want is a wreath or door arrangement that bleeds dyes onto your front door. Furniture: If you have a large front door stoop or porch, you can continue your front door decorating with appropriate furniture ranging from a weathered bench, crisp white rockers or wrought iron chairs. Don't forget to add weather-resistant fabrics for splashes of color. Hardware: Your choice of hardware can make or break your front door effect. If your home is rustic and the door you selected is in keeping with the design, you may opt for large hinges with flanges in a patina finish or rusted look with matching door knobs or handle sets. Kick plate: If your family uses the front door often, then you may want to invest in a kick plate, possibly on both sides of the door. This addition can keep your door looking new without the typical scuff marks that eventually scratch and detract from a door. There many styles and finishes are available to turn a utilitarian need into a decorative effect. Mail slot: If your mail is delivered at your door, then you may prefer to have a mail slot installed for added convenience and security. Brass is one of the most popular choices, but you can find other finishes. 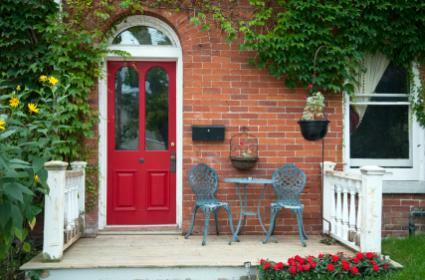 Planters and potted plants: One of the easiest front door designs is achieved with potted plants. This gives you the opportunity to carry the landscaping of your yard up to your front door. You can opt for large oversized planters for a larger home or just a few small potted plants for a smaller front door space. You can also change out the plants for flowers during the spring and summer months. Welcome mat: You can get very creative with the mat you place in front of your door. It can be highly serviceable for keeping debris out of your home while also becoming a significant design element. You may choose to replace the mat according to season or holiday. Don't forget the lighting! It's an important part to tying your front door décor together for a nighttime showcasing.